The bleak attraction of Under the Mountain is in its unflinching treatment of this problem. Mediocre science fiction – especially the early attempts – has always the faceless enemy alien that must be slaughtered for humanity to survive. It is the science fiction of persecution rather than personality, with little ethical content. Slow changes have seen this enemy change, become humanised, take on characteristics that humanity can empathise with. This leads to greater interaction between the two species – the possibility of communication or detente exists, and this possibility introduces a whole new different set of stakes. Under the Mountain lies somewhere between these two. Mr. Jones is implacable in his purpose. Killing the Wilberforces is the only option, their species must be exterminated from the cosmos for others to survive. No other tactic will work – certainly not negotiation. “You might just as well try talking to a school of sharks” (p 85). They are intelligent, lethal, and amoral. The amorality is key – the Wilberforces have no better nature to appeal to, no pity and no kindness. Yet neither do they appear to have any malice. They kill out of instinct, living up to their name: “the People who conquer and multiply”. They don’t kill for pleasure or for vengeance, and neither do they kill unnecessarily. When a Wilberforce attacks Rachel and Theo, it feels no need to kill them both: “Come with me. Come to the lake. One will be enough” (p 102). It is the same with Johan and Lenart – the Wilberforces need kill only one to ensure their own survival. They are not excessive or malicious or vengeful. And when Rachel has completed her part in defeating them, her part in what is essentially genocide, she is perfectly safe from them – there is now no reason to attack her, so they don’t. Another species would kill in both cases simply because it could. We are forced to consider that that other species might well be human. This is not to say that Under the Mountain presents genocide as an unthinkably evil possibility. When the question is kill or be killed, there is really only one realistic answer. Yet genocide in the name of survival is still genocide, and genocide committed, knowingly and willingly, by children…? Rachel at least is made unhappy by it: “She was troubled too by the thought that she was going to kill. The Wilberforces were the last of their kind. It was a crime” (p 125). Although she does not flinch from it, her part in what she considers to be criminal is not a moment of personal triumph. Rachel’s voice rose into the night, clear, thin, careful, the sort of voice she might use for recitation. But to Theo it contained a note of grief. 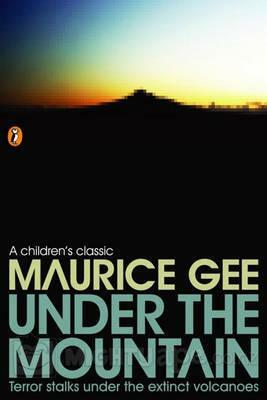 ‘Go down, People of the Mud’ (p 134). Theo’s reaction is less moral, but then he is the head instead of the heart of the pairing, and he is frustrated by the Jonesian poetry of his ritualistic response. ‘We bring you the gift of…’ he cried. And the final word was nearly lost. Why didn’t they say death when they meant it? ‘…oblivion’ (p 155). He is less troubled than his sister by their actions, but equally cognisant of them. It is a crime – the lesser of two evils, but still a fundamentally evil act. The baby Wilberforces slid across the parking lot. They stopped beside Theo a moment almost as if to keep him company. Then they went down. … the Wilberforces gave a haunting cry like the distant fading call of trumpets. They turned away from the stone and gathered a little way off in a circle (p 157). Is this too mere instinct? Or is it the first spark of feeling, the mark of a race that could one day be negotiated with if only they had survived? Wilberforces might have all the feelings of sharks, yet white pointers are still protected – even smallpox is not entirely eradicated. Had that spark been there all along, beyond the reach of the Jones’? Had the trauma of war robbed ‘the People who understand’ of their understanding? It is often said that in war there is no real winner, and such is the case in Under the Mountain. Rachel and Theo win the war, but in killing the Wilberforce family they lose their own – their process has been flawed, and their cousin, uncle and aunt are all killed because of it. With the death of the Wilberforces and the Jones, “the People of the mud, who conquer and multiply” and “the People who understand” it becomes inescapably evident that what is left – the humans – are a bastardised mixture of both. As a race, whether poets or scientists we understand what we do, and are capable of better and more moral decisions, and yet a soaring population growth that slaughters other species is one of our most characteristic calling cards. Rachel is not that far removed from Mr. Wilberforce, and Theo not that different from Mr. Jones. They are as capable – and as culpable. Gee has always been a careful writer. His books for adults are contemporary, non-genre character studies, where much is implied in few words. He is possibly one of the most observant writers that I have come across, but his childrens’ books are less obviously so. They are still terse, still concise. The fantasy and science fiction universes he works in are, in their own way, equally restrained and observant, and Under the Mountain is the pinnacle of this approach. I haven’t seen a single exclamation mark in the entire book, although the subject matter, in the hands of another author, would certainly call for them. The word “genocide” is never mentioned, and yet that is the fate of two of the three involved races; the long defeat of better selves. Instead a clean quiet prose, a drama entirely devoid of melodrama; a triumph underpinned by grief not for what has happened but for what was done. This makes it a real rarity in science fiction for children – but I wonder how many children pick up on it. Given the sad excuse for a movie adaptation previously mentioned, it certainly went over the heads of some of the adults.